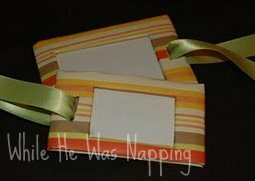 This originally posted on Someday Crafts back over the summer, but with gift giving season in full swing, I thought you might be interested in something DIY, cheap and easy. If you know any avid travelers, kids about to graduate and leave home, or if you have the ever-elusive diaper bag (or is that just at my house? )… how about some personalized luggage tags? Today, I have a fun (and easy) tutorial for you. It’s a perfect summer time project. My Mr. Right travels a lot for work. As I was trying to come up with Father’s Day gifts, I tripped over a suitcase. Literally. After I muttered a few irritated words and ripped the airline tag off, an idea hit. I don’t have a whole lot of extra cash rolling around right now, so a DIY was essential. It was relatively easy and they are sturdy (a lot sturdier than I thought they’d be). 1) Find a thick piece of cardboard. The thicker, the better. I used a Costco IZZE box. Cut it down to the height you want your luggage tags and double the width. Measure your piece of cardboard and find the middle. Score the opposite side of the cardboard so you can fold it in half. Mark out the window for your address. I used a small box of matches to measure it. 2) Cut out the window and fold your tag on the score. 3) Measure a piece of scrapbook paper. Leave some extra around all the edges. Put glue on one side of the cardboard and lay it face down on the paper. Flip the cardboard over and fold the extra paper over the top and bottom and glue it down (see the photo). I used Tacky Glue. It worked really well, other than there was some added drying time and I had to wait before moving on. 4) In your window, cut an “X”. Fold the paper back and glue it down. If there is any extra at the top and bottom, trim it off so it won’t be visible when you fold your tag in half. Put a little dot of glue in each of the corners to help keep them from tearing. 5) Cut a piece of thick plastic a little larger than the window. Just re-purpose the packaging from one of your purchases. I used the plastic cover from a Costco battery package, it was perfect. Glue it down. When it’s dry, apply glue on the side of the tag with the window. LEAVE THE TOP UNGLUED! If you glue the top, you won’t be able to slide your address tag into the holder. Fold the tag in half onto the glue and let it dry well. I suggest putting it under a couple of heavy books (or your 5-inch thick box of scrapbook paper). 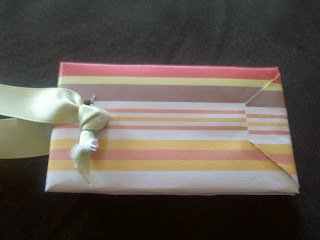 6) Fold the ends of the tag like you would a gift. Glue it down. Cut a slit in one end of your tags. Thread a coordinating ribbon through the slit. Your ribbon will need to be about 2.5 times as long as your tag. The thicker the ribbon, the better it will hold. Tie it in a knot and glue it a little to help it hold. 7) Write out your address and slide it in the top of your tag. That’s it! You’re done and you have some super cute, one-of-a-kind luggage tags. Easy to spot at baggage claim and you’ll know immediately that you grabbed the right bags. If you are worried about the paper tearing, you can do a thin layer of modge podge over the top to seal it. My Mr. Right saw these tags before Father’s Day and so I asked him if he liked them. He was less than impressed. My Mr. Right is very particular about everything having a purpose and the “airline tags are good enough” apparently. Men. In any case, I enjoyed making them and have since made some more for Little Monkey and myself. It’s a nice, easy way to tag your beach bag, diaper bag, stroller and many other items. If you’re worried about privacy, attach them to a small zipper inside your bag or with a safety pin.